The Cool City HFC-100 Helicopter Flight Control System is the ultimate in two axis autopilot (AP) and stability control and augmentation systems (SCAS). Consisting of a two-axis (roll/pitch) rate-based SCAS and two-axis (roll/pitch) rate/attitude based AP, the HFC-100 brings unparalleled performance and safety to light and medium sized rotorcraft at a fraction of the cost of systems that were designed many years ago. Included in the HFC-100, a rate-based Stability Control and Augmentation System improves basic rotorcraft stability and reduces the high-rate perturbations encountered in turbulence. The SCAS series actuators, installed in the rotorcraft’s primary control tubes, are very high-rate, low authority, electromechanical actuators. The actuators operate with approximately 10% control travel authority and take less than a second to move full actuator travel. For unquestioned safety, the actuators have internal electrical and mechanical stops. Operation of the Cool City SCAS is approved throughout the full flight envelope, from start-up to shut-down, and is virtually transparent to the pilot. The SCAS System improves rotorcraft safety by reducing pilot workload and fatigue, while improving the quality of ride for all occupants. In addition to the safety and ride-quality improvements of the SCAS, the HFC-100 provides a two-axis rate/attitude based autopilot system, increasing the pilot’s ability to handle the workload extremes of the rotorcraft cockpit environment. Although the SCAS and autopilot electronics are contained within a single box, the two systems are independent. Each has their own power inputs and internal power supplies; with a failure in one system not adversely affecting the remaining system. In addition, an autopilot failure will still leave the pilot with the option of Force Trim mode to hold the cyclic in the position of engagement; therefore, the pilot still has the ability to remove his hands from the cyclic for a short period for other duties without the worry of the helicopter deviating from the intended path. 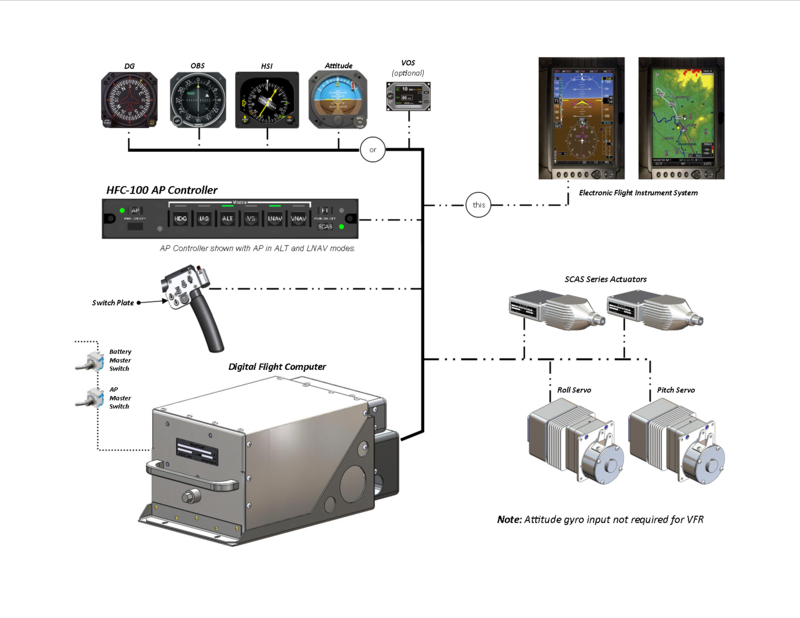 As designed, the Cool City HFC-100 will interface with essentially all models of installed attitude gyros, electronic flight instrument systems, and/or air data systems with outputs for the digital flight control system. To learn about these, and other exciting attributes of the HFC-100, contact your nearest dealer. © 2019 Cool City Avionics, all rights reserved.